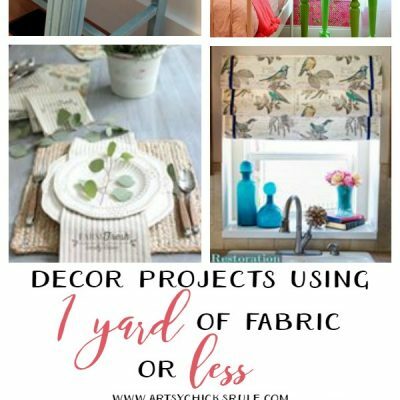 Want pretty window treatments? Don’t sew? 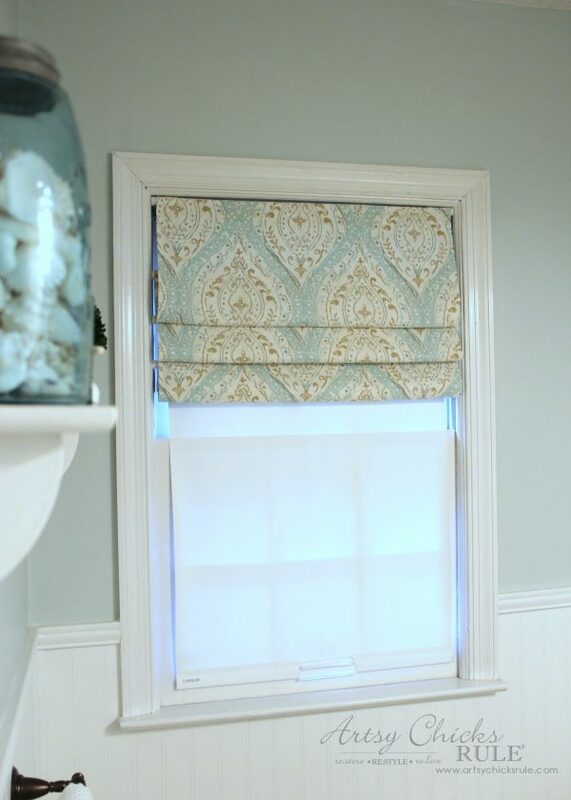 No worries, you can with this no sew faux roman shade! 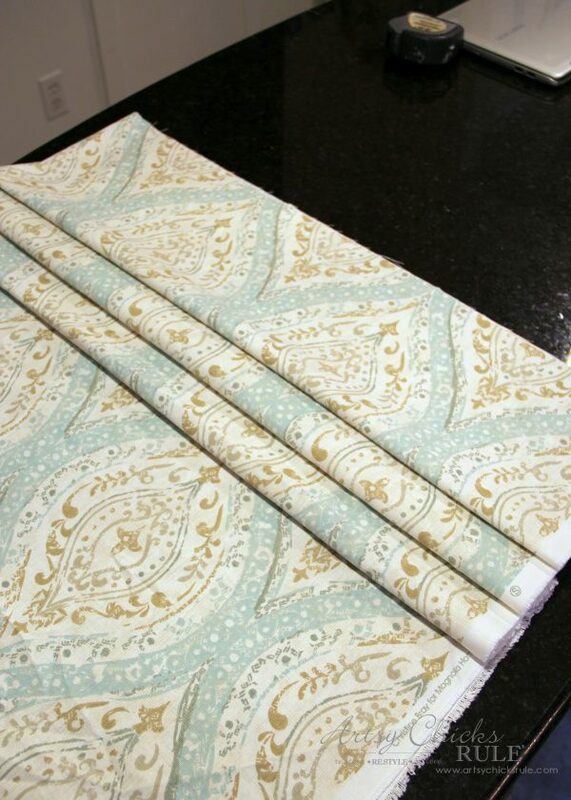 Let’s talk no sew faux roman shade today. And how simple it is to make! I’ve been a busy little bee! I’ve got lots going on in just about every room of this house. It would not be “normal” over here if there wasn’t something going on somewhere in here. 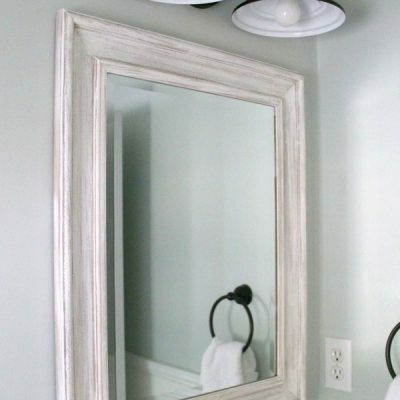 I’ve got mini makeovers going on in the guest bath, family room, dining room and kitchen. And soon to be laundry room. Gosh, I have all these plans and ideas swirling around in my head and darn, it takes so long to get them done! I will be sharing each and every detail with you guys over the next month or so….and then it’s on to Christmas decor! Can you believe it???? I know, you know, we all know…time flies! 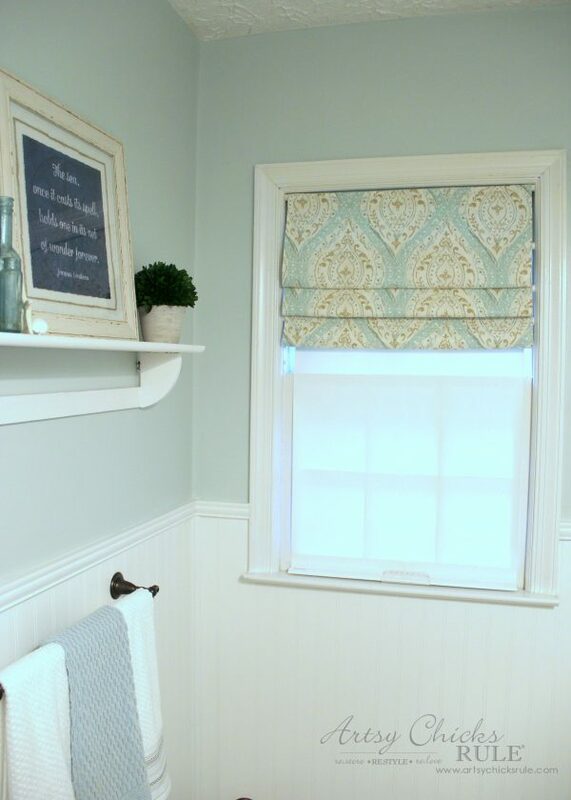 Today I’m sharing this easy peasy little window treatment I made for my guest bath makeover. I wanted something simple in here. Just inside the window to keep things neat and tidy and non-fussy. There’s lots of tutorials for this on the web if you do a search. I did a quick search and found Beth’s (Homestories AtoZ) here…. 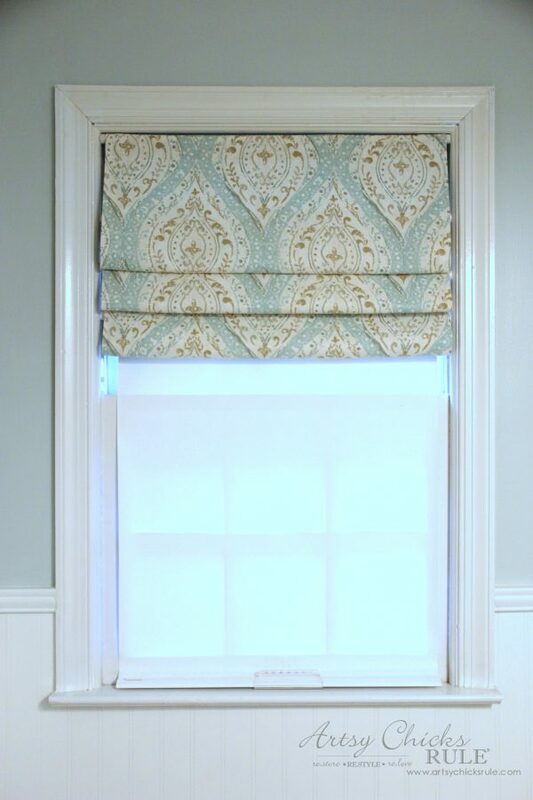 “How to Make Faux Roman Shades“. 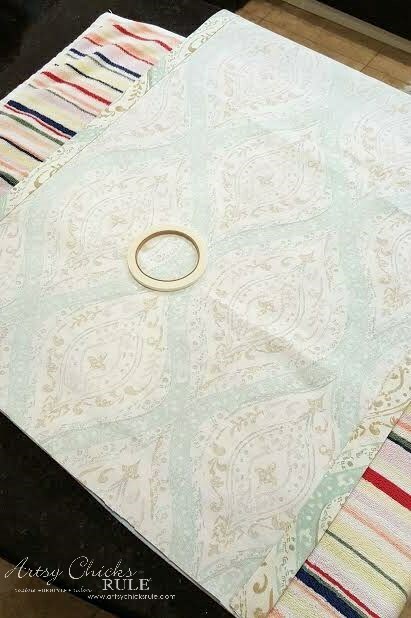 I’ll share how I made the “no sew” part and you can hop on over to her site and see how she used the tension rods to hang them. She described, with a bunch of photos, in perfect detail, how to hang these properly. 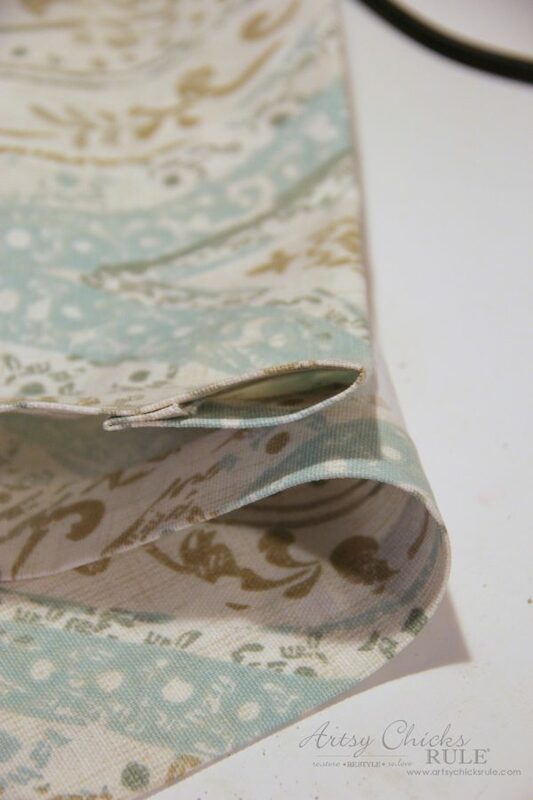 Here is the fabric I used to make my no sew faux roman shade…. And pretty simple, just fold and fold again. I use the iron on product I list down below. I made a “loop” seam at the top to put the top tension rod through so it would be secure. 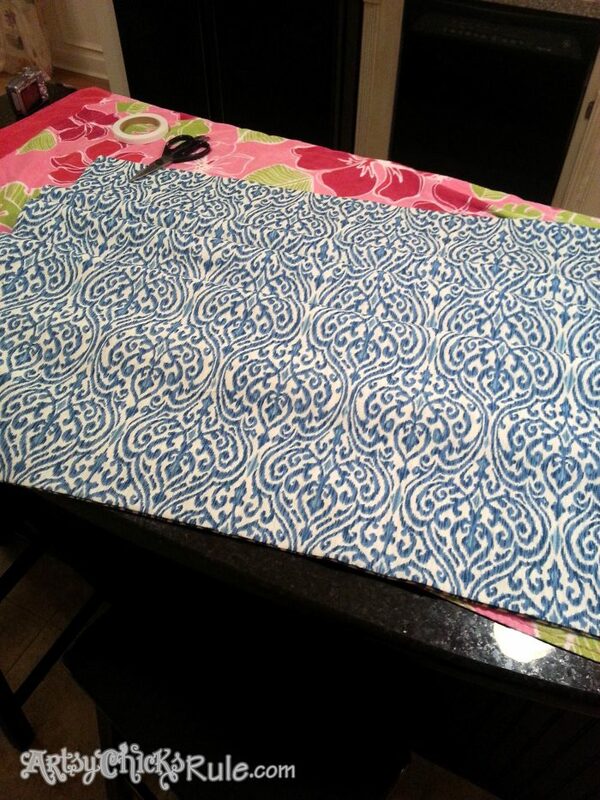 Nice and neat….and no sew! Perfect. I then added the tension rods inside the window frame and voila….. 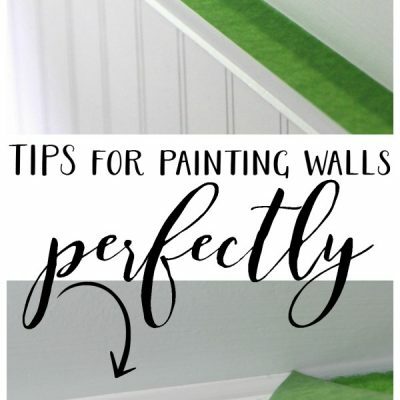 I love easy in decorating….and this was easy. 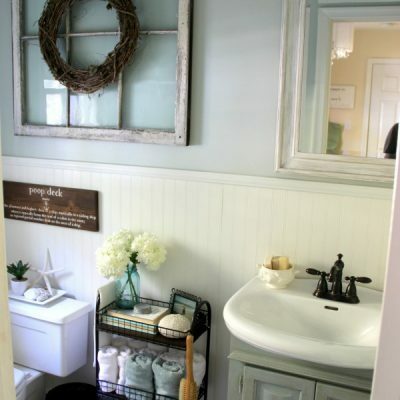 Little sneak peek of my guest bath makeover here too. MORE to come, this week and next. It really brightened things up in this tiny little guest bath. 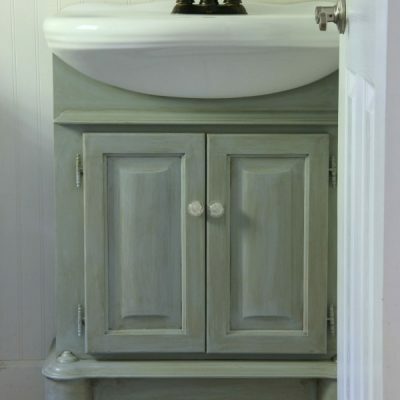 See the paint color I had in here previously >>> Guest Bath. Let me say what I always say on this blog here….YOU can make this. You can, really. You don’t need to know how to sew (I don’t!) 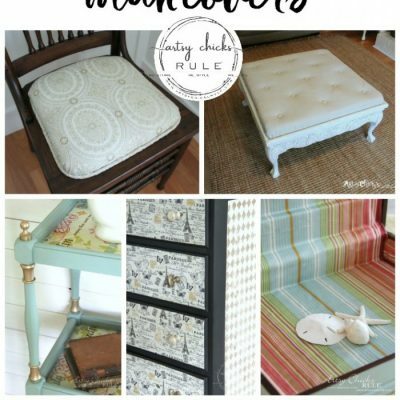 to make pretty things for your home. 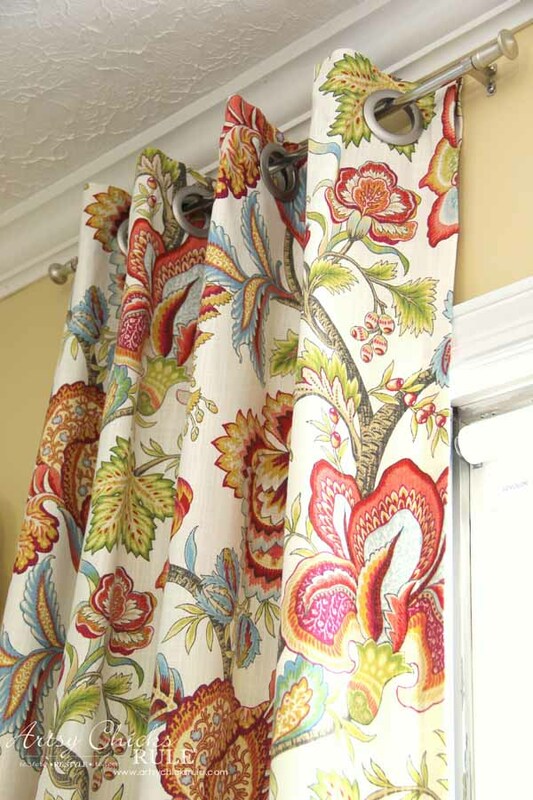 I have now made countless window treatments and curtains for my home. So please, don’t be intimidated. Just do it. 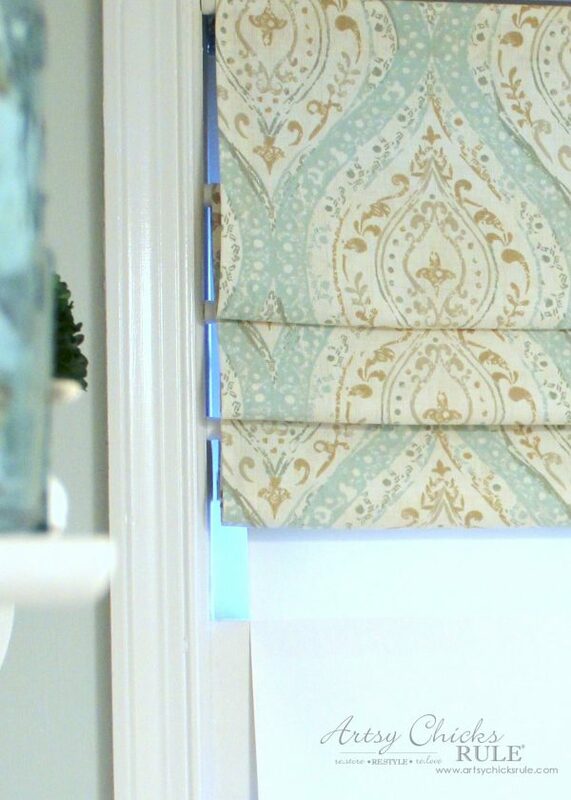 You can make a no sew faux roman shade too! Alright you guys, if you make one, please send me a note, email or something! 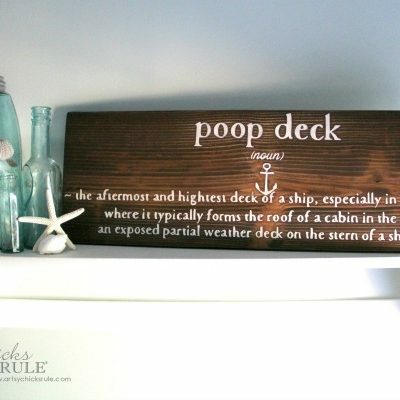 I’ll be back on Thursday with a fun little wood sign (<<<— see it now :) ) for my guest bath makeover. We are lighthearted over here and like to have a little fun. Be sure to stop by to see it! Love these! I have 3 large windows in my sitting room that are waiting to be covered. Thank you for sharing! hey girl love the roman shade! OK that is just adorable Nancy! Think I’ll make me one – you made it look so easy!!!! :) Hugs! That fabric is so pretty and I love that you accomplished this without pulling out your sewing machine. 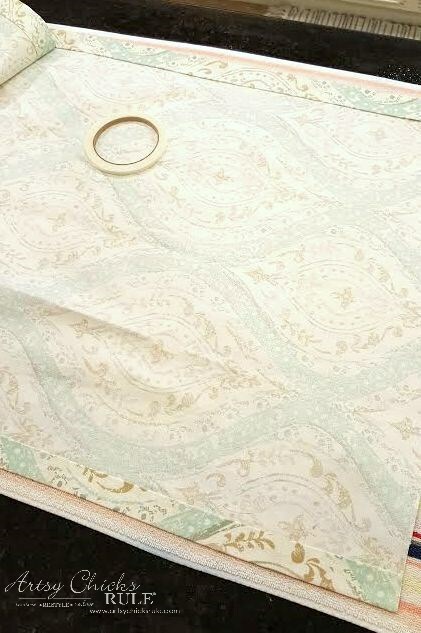 Ohhhh, I love that fabric!! Thanks Debbie!! Yes, you do!! How fun to have an entire new house to decorate!!! I can’t wait to see! Ohhh so cute! I am going to try this out soon! 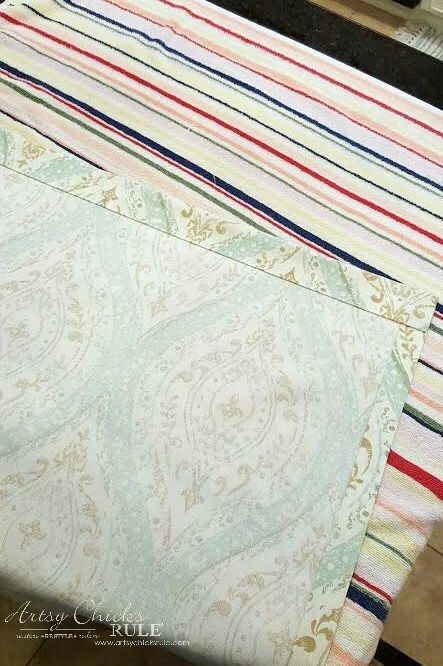 Where did you find your fabric? It’s gorgeous! Do you just go under and over the 3 tension rods? Do you think you could use the iron tape to make the folds with out using so many tension rods? Love these! What do they look like from outside? Can you see the rods?